Dill pickles is something I want to try this year. I have my garden out there and it looks like I am going to have a bumper crop of cucumbers this year. Last year's pickles were duds, too soft. Anyone have a good way to make good crunchy dill pickles? I have fresh dill growing in the garden, actually right next to the pickling cucumbers. Soak them in Pickling Lime. Buy a container of it and follow the directions...it works. For crispy pickles we put a hand full of grape leaves in the pickling solution before we heat it then take them out before putting in the jars. I think it is better than alum. We like them. Also watch your cooking time. Overcooking makes the pickles soft and mushy. Last edited by olsarg; August 09, 2008 at 00:35. 1. I forgot to stir the peppers after I added the boiling water but I'm thinking there weren't any air bubbles to work out. Is this likely and if I missed them, is it something to be worried about? The recipe calls for 1 in of headspace, which I did. 2. The "recipe" I had was just from the book for my Presto canner. No seasoning, etc... just boiling water over the peppers. Is this sufficient and any tips for next year to improve them? 3. How do I test the seal? turn them upside down AFTER they have cooled? 5. Is there any advantage to wide mouth jars other than access? 2. For peppers I would just leave them plain. I have played with some combos like green beans and onions but peppers are normally added to something else. 3. push down on the seal. If it pops down you do not have a seal. You should have heard them all go "tink", tink, tink.............tink as they cooled. 5. no and the std size lids are cheaper. 6. How many people ya cooking for? 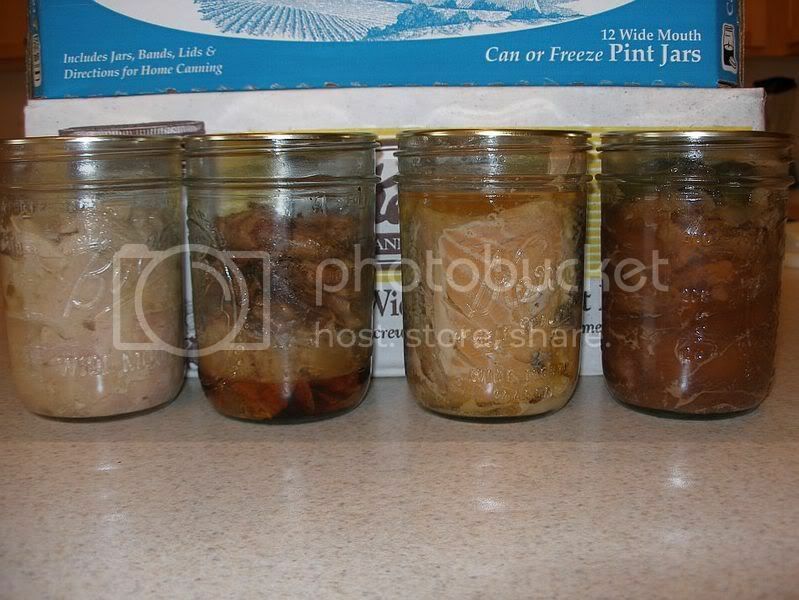 Cubed pork/beef/venison in a pint jar is about 3 good servings as it will cook down a little. I only add 2-3 Tbs of liquid for this. Turkey and chicken I cover in liquid. A Qt of chicken or turkey is allot of meat (ask Spatin) and is good for groups. I have one Qt of turkey left out of 8-9 Qts I canned last year and I think I reduced 2-21lb turkeys to 8-9 qts This year I will do pints as there was just too much meat for just 2-3 people. I made Turkey Alfredo last night because we had 6 people eating and I still had leftovers. Since we have a few more weeks before the Turkeys come on sale I think I will use the last Qt of it for turkey Tacos since they are always popular around here. I just weighed the last turkey and I got 30 Oz of meat in a Qt. Your welcome. You get giddy when all you see are $3.99Lb signs and you realize that you canned 10 pints of the stuff at $1.50lb when it was on sale. Out of the 8 Qts we canned last year we have one left. Going to put it up in mostly pints this time as a Qt was too big for us. Yeah, I'm thinking about canning ours (turkey), we get a "free" one for accumulating points at our local supermarket, as per your advice. 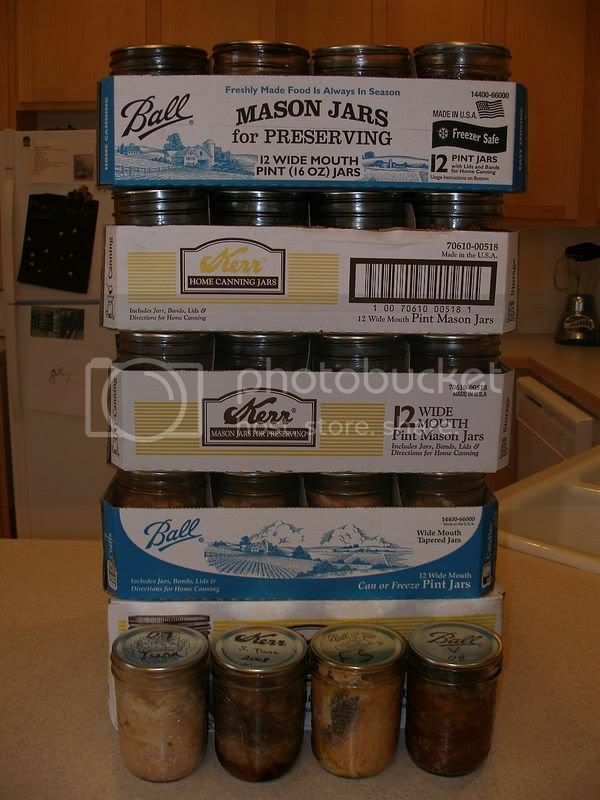 I got a couple of cases of pint jars (and some quarts). They were about $7.50/case. that seem about right? That's about right. last I bought at Chinamart were $7 for pints. Unless you have a big family I would only put up a couple in quarts. A 21lb bird should get you 2 quarts and 4-5 pints of mixed meat. It is a nice and cheap change of pace to have a turkey dinner some other time other than Thanksgiving. Alright...I've got deer and turkey to can. Couple of questions..
1. My canned peppers seemed a little mushy when I popped open a can to put in my stew. I only quartered them and tried to cut them up a little more before adding..anyway, is this fairly normal? They were yellow banana peppers if that helps. 2. Can I mix different cuts of meet without affecting flavor much? Light/dark, shoulder/hind quarter..or is it better to keep them seperate? 3. Just cube the pieces or slices? What size? 4. Can I just do a cold pack with raw meat and poultry in pint jars, leave an inch of headspace and cook away as per recommended time? Any easy additives to improve flavor? (Jerry, I read you mentioned a little chicken broth with the turkey.) I read somewhere its good to wipe the rims with vinegar to make sure there is no grease to inhibit the lid sealing..good idea? As always, thanks a bunch! I'll defer to Jerry, but I have canned some chicken breasts and some smoked turkey, using store bought chicken broth as the liquid in the jars. We tried some of the chicken breasts some weeks ago and they were wonderful, juicy and tasty. I mixed the turkey white meat and dark meat so as to have some of each in every jar. Haven't tried that yet, but I did have some of Jerry's at the last FAL Fest and it was very good. I also canned some of last year's deer. I defrosted it, then cut it into cube sized pieces. I put the deer meat in a couple of slow cookers for about 6 hours and then canned them in their own juice. Got 14 pints of processed deer meat. Cooked some in onions a while back and they were delicious (and I'm still here so I must have done something right). I didn't use vinegar to wipe the rims. I just cleaned them real good with a wet towel before setting the cap seals. No problems yet, but if I think about it I'll use vinegar the next time. Thanks Spatin.. So, you did a cold pack on the turkey/chicken and slow cooked the venison for 6 hours? I'll check the recipe book that came with my canner again. I was hoping to just cook it while I canned it so to speak. I figured the meats juices would mix in with the water that way. Maybe use beef broth with the venison?...just pondering...I'd like it to taste good and not just be edible, but I guess a lot of that can come with seasonings after the fact. On the chicken, I browned it a little bit in a large skillet before I put it in the jars. On the turkey, I smoked it for about 6 hours. On the deer, I slow cooked it for about 6 hours. Last edited by spatin; December 03, 2008 at 21:47. Well, I ended up slow cooking the venison about 6 to 8 hours overnight. I packed it in the broth and ended up with 17 pints. I imagine its a little overcooked but its tender and all the nutrients are thee. I'll probably try a pint in a week or so. I found I ended up with the containers about 2/3 to 3/4 full of meat even though I thought I packed them fully to the 1" headspace. My directions fo5 the cnaner said to cook/brown till rare. Anywya, thnaks for the help...i'll probably do the turkey tomorrow or Sunday. When you end up with the meat floating up and a space in the jar below the meat, you probably didn't pack it tight enough. Have fun with canning. I have enjoyed it, and having something to eat on the shelf that doesn't need refrigeration is pretty nice. The meat isn't floating, but the jar isn't full per se. I have another question, I used the broth from the slow cooking as a hot pack and have noticed a film of fat forming on the top of the broth in the cooled jars. Is this GTG or did I make a boo boo and it will turn rancid or is rancidity an oxidation process requiring air? No. Don't worry about the fat circle floating at the top of the deer meat. As long as you have a good seal it will be fine. I have cooked that down and the fat just melts down into the meat and everything is delicious. Just be sure to cook it down about 15-20 minutes to make sure you kill all those little botulism cells that are waiting to ambush you. Thanks Sidney...you're comment has me thinking though... I thought all of the pressure cooking killed the botulinum toxin and no further cooking would be required. Basically, you could eat the food cold, right out of the jar (provided it sealed and you cooked it at pressure for the required time.) Are you just recommending that as that is how you do it or is further cooking absolutely required? I know that some people will eat it right out of the jar if it smells ok. The govt and university websites all recommend that low acid food (ie meats and most vegetables) be boiled or cooked to boiling temperature for at least 15 minutes (plus a minute for each 1,000 ft. above 5,000 ft.) to kill or deactivate any botulism toxin that might be in the food. Remember that botulism is tasteless and oderless so it doesn't matter what the food smells like. It could still be in there waiting to strike you down if you don't take the proper precautions. Read up on it at the various university and government websites on the subject. If there was no way to cook it, I might take the chance with my own canned product because I know it was done correctly. But as long as I have a pot and a fire, I'm going to cook it as recommended. As I'm writing this, I am listening to the dance of the pressure regulator on my Presto canner, as I am canning 8 pints of pork shoulder blade country style cuts. Albertsons had them for just .99 a pound, and I am just out of freezer space so they go into the jars. I'll smile when I use one of those pints to make some yummy posole in the future, or maybe something else that requires pork meat. Yum. Thanks for the tips jerry. I cooked it for about 45 minutes in the oven to get it browned and cooked to about "rare". Can anyone get me a copy of the user manual for an All American 921? Last edited by PBR Streetgang; December 14, 2008 at 10:33. Here is a little bit of my stash. I do my Venison cold pack with no water or broth. I add sliced jalapeño, chunks of garlic, onion, Montreal steak seasoning, pepper, and a teaspoon of salt. Turns out real good ! Just getting started. So far the ground meat has the best flavor. What are your favorite recipes to can meats? Please give specific instructions. I gave my recipe above for Venison. I also have friends that just use salt and pepper with raw packed meat, no water or broth added. It is also very tasty ! Thanks for the tip on the venison. I cooked mine in the crock pot on low overnight and packed it in the broth that formed. It kind of looks like the jar you pictured in the photo...its should be tender to say the least. Hopefully still flavorful and not too overcooked. I'm going to try your cold-pack recipe next time I can (maybe with beef just for the heck of it.) I feel the need to add liquid, even though its not necessary in many applications. I did my turkey in chicken broth (with turkey drippings mixed in.) I'm going to have to crack open a jar of this stuff one of these days. I just had some of that turkey (packed in chicken broth) a few days ago, and it was delicious. Another canning success. Just don't forget to cook it before eating to kill the pathogens. Hey..I need advice. I canned some peppers from this year and while they turned out OK for putting in Chili, they are very mushy. I quartered them, blanched them for about 2 minutes, and canned them for 90 min in a wet-pack as per my canners' directions. Any tips for keeping them firmer or other prep methods? No, I think the canning process takes the starch out of them. I have never seen any canned peppers that were not cooked and mushy. You could slice them up and dry them in an oven or dehydrate them. I have some very crunchy cayenne peppers that I dehydrated in my "Ronco" dehydrator and they are very dry. I can take out a few pieces and crunch them up in my fingers to put in soup, chili, gumbo or whatever. Had a pint of venison last night w/juice ove rmashed taters form dehydrated flakes...mmmm.... While I had a tinge of regret not boiling it for 15 minutes first, all is well and it was tasty. Thanks for all the pointers I got! I just ate some bacon I canned on 7-30-08 and it was real tasty! My only complaint is that it all broke apart as I was taking it out of the can to fry it. I was using it as bits for a German potato salad, so no biggie. In the next month or so I'm gonna can some more but this time I'm going to lay it out on parchment paper, after the pre-cook, then roll the strips up into a log then put it in a wide mouth jar. We'll see if I can get actual strips out of it then. My other cans will be good for making hash or anything else where bits are used. And a small update. We had spaghetti tonight and used a jar of ground beef that was 2 years old. No problems with the smell or taste and so far we are still alive. I only have one small jar left from that era and am going to wait a little longer to use it. As a side note the base for the sauce was a can of spaghetti sauce with a "use by" date of june 2008. just getting a handle on some of the life of the items. Chicken is back on sale so it is time to can some more of that. My stock of canned meat is down in general. Where is chicken on sale Jerry? I am down on FBCBs and need to can a bunch more! The mexican food store circle and monterey. $1.69 a lb for bonless/skinless breasts. you could try pickling them. we made some microwave pickles the other day that turned out very well. gonna take a shot at some peaches this week. one of the part timers here works at a research station and is hauling them in my the bushel. Got 15 "pesos" today over at the Mexican food market. It was $1.69 a peso. Good call. Thanks for the information. Your welcome. I got 4 packages myself. About 17 pesos here. Going to can a batch tonight and tomorrow. I pickle my peppers as well. Pretty sure I have a peck I could pickled promptly(hungarian wax). Basically just pack them in jars and pour a boiling seasoned vinegar based brine over them. Do you have a recipe for that brine? How long will they last that way? Need to be refrigerated I guess? Thanks, I'm guessing you can make a little over 8 pints or 4 qts when you include the peppers in the jars? Also, you don't do any hot water bath or anything? Just the cooling of the boiling water is enough to seal the lids? Also, are you taking the lids out of boiling water as you seal them or is the boiling just done prior for sterilization? Peppers take more brine than you would imagine( not much volume there), this will do 5-6 pints probably. The contraction of the brine cooling will seal them and draw down the lids. You can process them afterwards, but that is how they get mushy. Not so much the chicken but if you are looking for fruits (my dehydrator has been doing overtime) check out the new store on the NW corner of Academy and Dublin, Sun Flower Markets. Last Wednesday I picked up 5lbs of bananas, 4 pineapples, 3 oranges and a pound of good bulk coffee all for under 20 bucks. The prices are comparable to COSTCO but you can buy as little or as much you want, the fruits seemed fresher too, no membership fee. It was packed at 3pm when I went through, I'm planning on going earlier this weekend to get a better idea of what they have (I hate crowds). Ditto. I live next to a large farm that plants feed corn and beans on a rotation. LOTS of deer and turkeys. The farmer encourages me to hunt the fence line. I have friends that hunt, but only eat limited amounts of venison. Between what I shoot, what my "wife shoots", and what my friends shoot, but don't really want I typically fill the freezers and then pressure can about 250 quarts of venison and turkey meat. I also can most of our vegetables. The only thing we buy is seafood, the occasional steak, bacon and some pork sausage (mostly we use venison sausage), specialty vegetables (asparagus for instance) or fresh vegetables outside of the local season (salad greens out of season). Our annual purchased food budget probably runs less than $1000. I do most of the canning in my workshop on an old wood stove. I have seen there ads. The mexi store has round steak on sale this thursday for $1.69 lb so I am going to make some ground round out of it.